Partnerships with school districts, state agencies, non-profit and for-profit organizations, community agencies, and other Johns Hopkins units are an important part of the work of the School of Education. Whether its placing teaching students in schools where they will acquire valuable classroom experience, working with districts on ways to enhance teacher knowledge in Science, Technology, Engineering or Mathematics (STEM), providing school counseling support for inner city youth who need support in school, or working with other research entities to develop innovative new curriculum, partnerships are an important part of the learning process and an important part of the School’s contribution to the communities we serve. SOE has recently committed to expanding these efforts by taking on new initiatives involving the management and oversight of several programs that contribute to our mission. 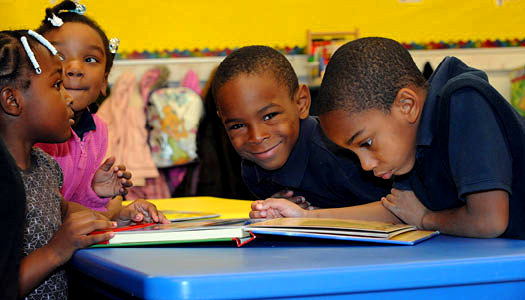 In 2012, SOE began operating the East Baltimore Community School which serves 300 K-8 students. In the fall of 2013, the school opened a new $40 million campus and early childhood center, which SOE also operates. The new facility is renamed the Elmer A. Henderson: A Johns Hopkins Partnership School. The early childhood program is called the Harry and Jeanette Weinberg Early Childhood Center. Formally the East Baltimore Community School, Henderson-Hopkins opened in January 2014. This new facility features a unique state-of-the-art approach to serving children from birth through eighth grade. The seven-acre Henderson-Hopkins campus combines the Harry and Jeanette Weinberg Early Childhood Center and the Elmer A. Henderson: A Johns Hopkins Partnership School in one conjoined facility, with shared family resource, health, auditorium and gymnasium spaces. Teach for America (TFA) – In the past decade more than 1100 TFA teachers have earned their teaching degree at SOE. Urban Teachers – SOE’s partnership with Urban Teachers offers a Master of Science in Education and prepares new teachers to succeed in the complex work of teaching in urban schools. Through the partnership, the degree offers new teachers training in both general and special education, equipping them to meet the needs of all learners. Content program paths include Elementary Education, Secondary Language Arts and Secondary Mathematics. STEM Achievement in Baltimore Elementary Schools (SABES) – Supported by a $7.4 million National Science Foundation grant, SABES offers a unique partnership approach to teaching STEM education in Baltimore that actively engages teachers, students, and the surrounding communities. Schools include Margaret Brent, Arlington, Martin Luther King, Langston Hughes, and both Highlandtown elementary schools. Brain Targeted Teaching (BTT) – Designed by SOE’s Mariale Hardiman, BTT is a teaching framework that is informed by research from the learning sciences. More than 100 teachers in Baltimore City Public Schools have received intensive training in the model (30 hours) through professional development and JHU graduate courses. Talent Development Secondary (TDS) – A program adopted by two Baltimore City schools, Augusta Fells Savage and Talent Development High School, TDS is a comprehensive evidence-based reform model aimed at turning around poorly performing middle and high schools. Professional Development Schools (PDS) – A strong tool to support student learning, Professional Development Schools are active learning environments, supported by SOE, that have a four-fold mission: preparing new teachers, faculty development, enhancing student achievement, and improving the practice of teaching. Baltimore Fellows – Open to recent graduates of the Krieger School of Arts and Sciences, SOE supports five students working on their Master of Arts in Teaching degree who are interested in urban school reform. Students internships are completed in low performing Baltimore City schools. Center for Technology in Education (CTE) – In partnership with the Maryland State Department of Education, CTE has designed, developed and provided professional development training on several database and decision making applications. Baltimore City uses several of these applications, most notably the Maryland Online Individualized Education Program (IEP) application. Maryland Teaching Consortium Grant – With this MSDE grant, SOE provides professional development to faculty in high poverty schools to improve student achievement. Early Learning Partnership – With support from the i3 grant, the Center for Social Organization of Schools provides web-based training for early childhood teachers in evidenced-based training to foster language and literacy skills development. National Network of Partnership Schools – This initiative includes three Baltimore City schools in its network, which provides information/PD for forming school, family, community partnerships. Stocks in the Future (SIF) – Housed in the Center for Social Organization of Schools, SIF is a supplementary curriculum that teaches students about investment and offers students shares of stock in return for good attendance and academic achievement. The program has been adopted in 13 schools in Baltimore City. School Counseling Fellows – Through this program, SOE places master’s students in Baltimore City schools where they complete their internships. Internships involve creating systemic counseling interventions based on data targeted to a specific need such as poor grades or low attendance. Paul Robeson Academic International School of Excellence (PRAISE) – Housed at the Education Building, PRAISE helps African-American males in Baltimore become competitive applicants to four-year colleges/universities. SOE provides counseling and tutoring to support students in reaching their academic and personal goals. PreK at Play – A leading supporter of this Baltimore City Public Schools initiative, SOE coordinates efforts among the JHU schools of Nursing, Arts and Sciences, Engineering, and Peabody to offer a unique learning experience to four-year olds from high-poverty schools. Urban Health Institute – Targeted in east Baltimore, SOE is actively involved in this joint effort bringing together the resources of Johns Hopkins and the City of Baltimore to improve the community’s health and well-being with the goal of forging University-community partnerships in health care, education, and community planning. An SOE faculty member serves on the advisory board. Dunbar – Hopkins Health Initiative – Working with Dunbar High School faculty and staff, SOE provides academic and counseling support to students to increase college and career readiness for the health professions. An SOE faculty member co-chairs the Institute. The School of Education’s student teaching or clinical field experience for pre-service teachers is aligned with The Redesign of Teacher Education that requires teacher preparation programs in Maryland to focus on school improvement and increased student achievement, thus enhancing teaching and learning for all children. MAT program faculty members collaborate with district partners to develop Professional Development Schools (PDS) in local school districts. Within this PDS framework, JHU faculty members conduct professional development activities for mentor teachers and provide supervision of student teachers. The collaborative nature of the PDS environment allows for continuous evaluation and the growth of pre-service teachers.